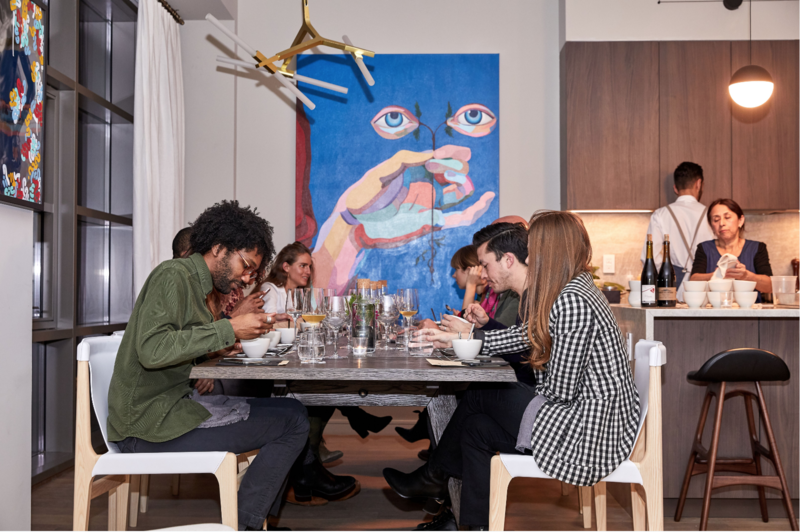 Resident, which hosts intimate pop-up dinners in private spaces, offers chefs creative control, networking opportunities, and a platform to boost their profiles—all without crippling overhead costs. There's nothing new about a supper club. The basic structure—of one-off ticketed dinners in intimate spaces—offers diners an escape from the loud, dark sterility of many hot-ticket residents, while also facilitating mingling among guests. Yet , the New York-grown startup from Brian Mommsen, is a little bit different. For one, the up-and-coming chefs who cook at Resident do so for upwards of six months—sometimes even eighteen. Resident's current chef Matt Cruz, formerly of San Francisco’s Michelin-starred In Situ and Lazy Bear, hopes to stay on for at least a year. He said getting the gig at Resident was like "winning the lottery." "It's my own mini-concept within the platform, and I have total creative control," he said. "Having all the infrastructure that Resident provides is a dream come true; I would have had to front all that money on my own and seek capital, and I didn’t have to do that." About two years ago, Mommsen, who has a finance background, and his wife moved into a roomy townhouse near the Brooklyn Navy Yard, and he found that he wanted to breathe some creative life into the space, even though he was barely home. That's when he met Jonah Reider, the Pith chef who grew a cult following serving dinners out of his dorm room at Columbia University. In 2017, Reider told The Times, "They’re like 'the rich parents' I never had." Indeed, Mommsen, who says the business is sustained by ticket sales and private events, can offer chefs something that few supper clubs can: a rare level of financial security, which, in turn, gives chefs room to breathe and experiment and, possibly, network with well-connected guests who clearly love food. At a recent dinner, chef Cruz prepared a meticulous, deeply personal multi-course menu for a table of twelve. The setting was a yet-to-open luxury apartment building in Williamsburg, at 138 N. 10th street, still surrounded in scaffolding, but after climbing the unfinished stairs, I found the apartment to be elegantly finished with art, furniture, and hors d'oeuvres of uni-topped oysters and mini pastries crowned with beef tartare. Amy Pastre and Courtney Rowson, the founders of , handled every design element, from the menu to the logo, when Resident offiicially launched in August 2018. Cruz introduced all seven of his courses with an anecdote on the inspiration, which often traced back to his childhood. Perhaps the most memorable dish was a soothing broth flavored with country ham, charred onions, and thyme oil, served with family-style bowls of grilled bread. "My grandma used to make a simple drinking soup," Cruz said. "Being able to serve something so simple that speaks to people and is nostalgic to them is important to me. The benefit of Resident is that I'm right there and get to explain those stories. Having context behind the dishes totally changes the perspective." The first Resident chef was Behzad Jamshidi, who cooked with Mommsen from August to March. Mommsen aims to open a second location in Brooklyn in June—which will also be a private residence, perhaps that the chef will live in. He also hopes to open two or three locations in Manhattan in the coming months. 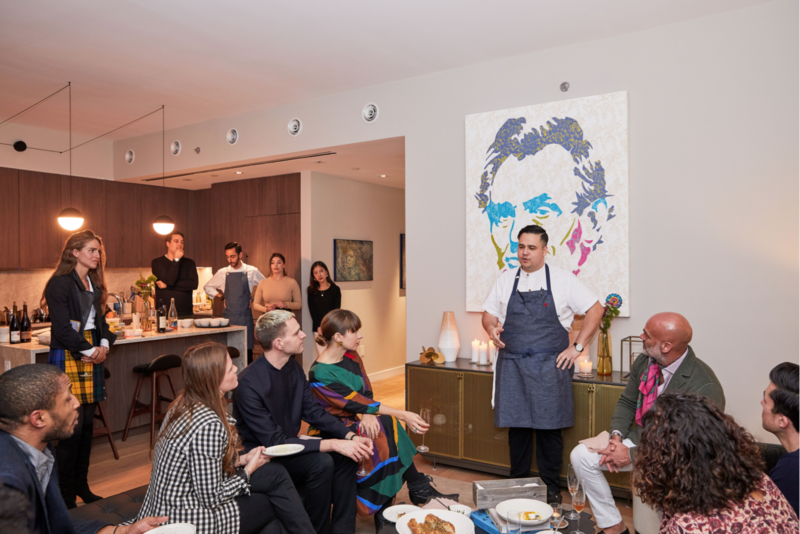 "You could come to an April dinner and then come back in May, and one dinner may be with an Italian artist and chef in Brooklyn, and in May you can go to a resident dinner in the Lower East Side with a Korean chef and Asian art," said Mommsen. "When you run a supper club, you have to worry about things like venue spaces, ticketing, website, all the sourcing of food and wine," he continued. "Starting this out of my house, I wanted to be able to create something that could allow the chefs to focus on the most important part—the core of their interest: creatively curating the menu and being able to interact with guests." Tickets to upcoming Resident dinners are available on . The seven-course dinners, which include wine pairings, cost $150.